Looking for the rubber gasket that go'es under the hood ornament. I'm trying to find door glass installation and adjustments information? Having a difficult time adjusting mine so I don't have wind noise. 1. Loosen two bolts (A) and adjust by rotating glass until a constant distance is gained between front edge of glass and the windshield pillar. Retighten bolts (A). 2. Loosen front and rear stop screws (B). Roll glass up until it properly seats in roof weather strip. Movefront and rear stops until they contact window rollers. Retighten screws (B). 3. Loosen three bolts (C). Move glass towards windshield pillar weather strip until it properly seats in the stripping. Retighten bolts (C). 4. Loosen bolts (D,E). Back off adjusting screws (G). Move top edge of glass inboard until it is properly seated against roof rail weatherstrip. 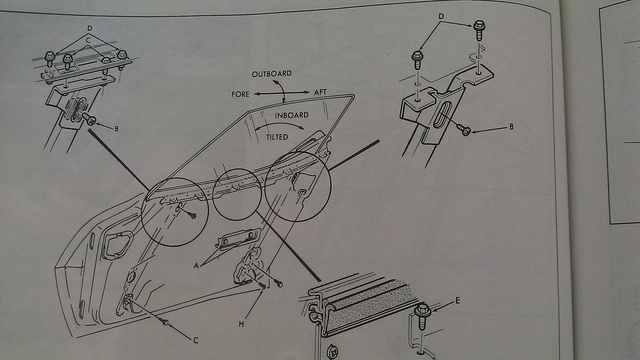 Tighten bolts (D). Move felt weatherstrip against window. Tighten bolts (E). Turn adjusting screws so that the inner nylon pads are in light contact with wedges. 5. Loosen screw (H) and roll glass down until top edge is flush with outer panel. Move stop to contact window roller. Retighten screw (H). *If a complete door window adjustment is needed, fully adjust window by following all the steps given above in the order given. Now...this is all fine and dandy; except under #4 above, there is no "G" on the diagram. I believe they meant to say "B"? Hope this helps. Even though it should be fairly easy to ajust the Windows it is not. It still takes alot of time and patience even with a service manual. I Found that it is importent that the door itself sit right and that there is no play in the door hinges. Tjek and fix those 2 things first, or it will be close to impossible to get the Windows working right. Also the window mechanism must be in good condition and greased up. Then If all is good it is just a matter of keep adjusting and Being patience, then it will sit right soner or later. But it is one of the hardest Windows to get sitting right. Im pretty sure i used a couple of hours a piece, when i put my chevelle back together after i restored it. Do you need to adjust the window when the door is closed or when the door is open? My drivers side seems like it needs to be pushed to the back farther. The passenger side seems okay so I think the correct glass in the doors and they came from the same car which I don't think was an el camino. You'd know it if the glass came out of an El Camino. Back edge profile is very different and wouldn't begin to follow the contour of your "B" pillar. I've probably removed 12-15 door windows out in the yards and have that down to a science. But, the very prospect of having to reinstall one and align it intimidates the hell out of me. Am I wrong or elco before 75 has one diagonal rail inside the door where glass slides? Not front and rear straight ones like on scheme. I can tell you that its a pain in the ... To adjust the glass in the doors. But its not rocket science. The glass can be adjustet in all directions, and it takes alot of time. But it can be done. I did mine and i Found that the door itself needs to sit exactly right first, cause if not then you need to adjust glass again if you move the door even a little. Also i had a problem with the door closing hard when the window was all the Way up. So i learned that the stops need to sit exact right, so the window dosent push the door Down when closing. Im pretty sure though that these cars was far from water tight when new. I get a little water in if i spray to much right on the glass when i wash it. So i try to keep from spraying water where i know it can get in. Same thing with the Cowl area. Its proned to be leaking up under the dash, especially where the heater goes trough in to the Cowl.